Disclaimer:  This post contains affiliate & referral links at no extra cost to you and helps maintain the site and the information on it. Thank you for your support! 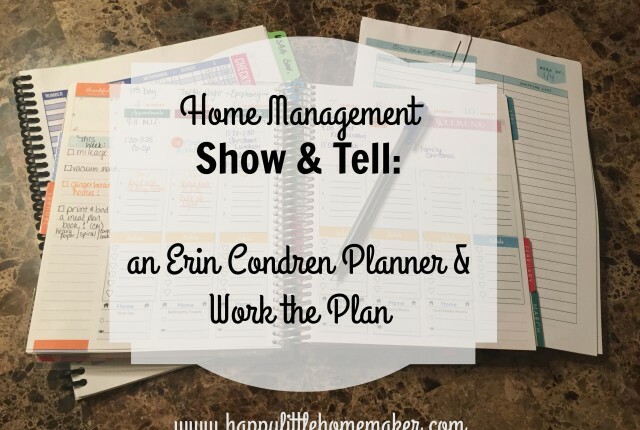 Last week I shared how I use my Erin Condran Planner with Mystie Winkler’s Work the Plan task management system. If you are unfamiliar with it, it’s like GTD & project management for homeschoolers/homemakers/busy women everywhere! My husband was eavesdropping on my videos and was totally impressed. 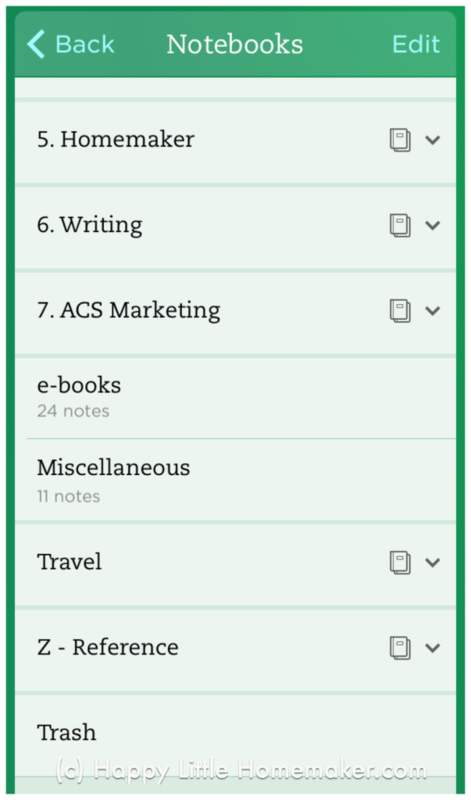 That being said, I wanted to share a bit about keeping notes, project files and such organized, as well as how I stay on top of things with a weekly review. My notes system is set up much like Mystie’s. 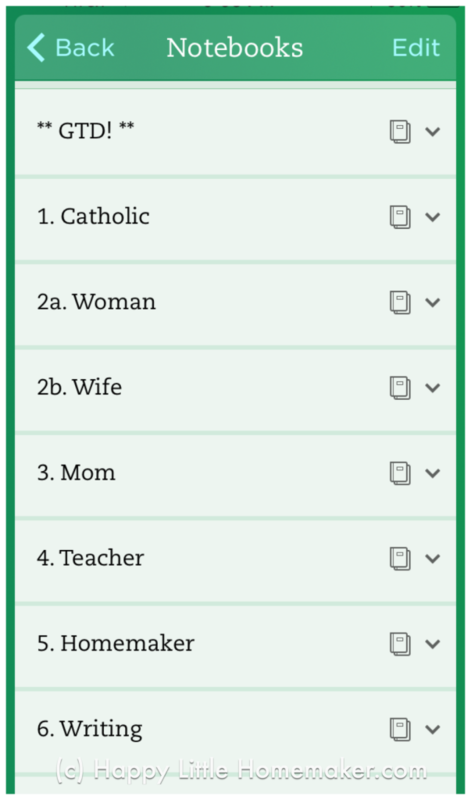 If you’ve ever looked at the navigation of my blog, it is divided by major roles of my vocation according to the book A Mother’s Rule of Life. My Pinterest is set up the same way. 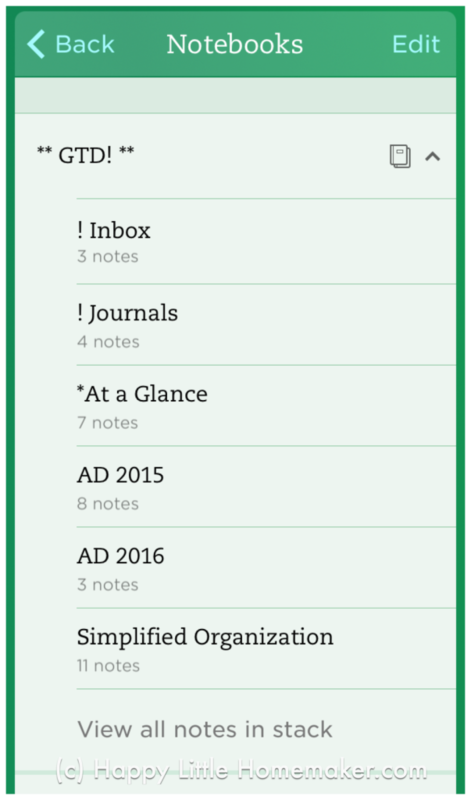 When she suggested setting up your Evernote account that way, I seriously slapped my head. Of course! Why not set up my EN stacks the same way I organize everything else? So I did what she said and rearranged it all one night from my iPhone during an episode of Star Trek: Voyager. The app is pretty robust. I had a few stacks to create on my computer. It led to a rabbit trail project of rearranging my files on the file server this way, too. Ahem. Finishing that is on my brain dump :). I set up my GTD folder per her Work the Plan video course. 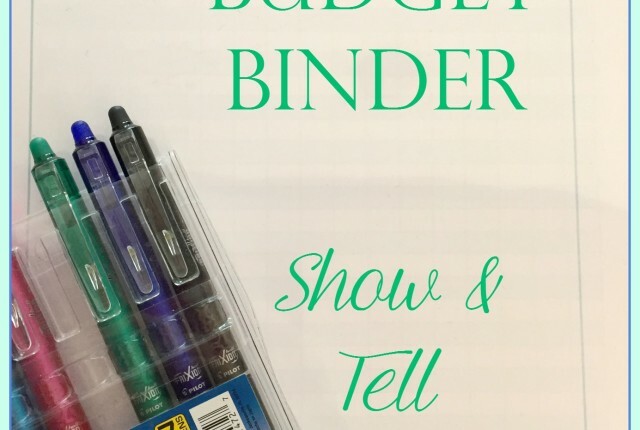 To see what is in her folders, you’ll have to sign up for Simplified Organization for the full scoop ;). (This post is not sponsored by her, but I offered to share how I’ve customized her system. I paid for Simplified Organization & Work the Plan myself). I have folders set up for each of my vocational roles, though it’s a bit of a merge between A Mother’s Rule of Life and Work the Plan. My writing and work are no longer primary vocations but still need a place for all my notes. I keep articles, ideas, book lists, plans, project notes and more within these stacks. Now that kids are older and amuse each other for fairly long periods of time, I can usually not only get things on my list done, but can be a little strategic about it. 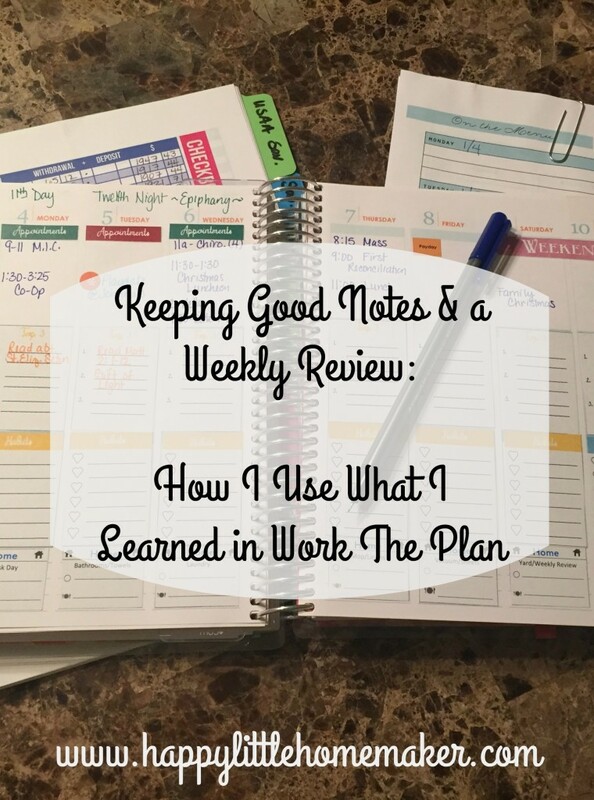 I’ve loved Getting Things Done/GTD for a long time and even reviewed a GTD system for mom‘s in the past. Mystie’s Work the Plan does a fantastic job of breaking it down for mom’s and the weekly review really is key. I’m still getting into a groove with it, so it takes awhile because I have to consult my list of steps. Go through my all purpose notebook and scan & file or throw out as appropriate. While I’m doing this, I keep my brain dump notebook handy. As I’m going though this process I always remember a handful of things I wanted to do. I also go though my brain dump list quickly and scan for things I got around to doing. I usually take a few minutes to look at what I’m doing and why. I check goals, projects & habits and ask myself if they are still valid. Sometimes big life events may change plans. Things like expecting a new baby, taking care of a parent, an unexpected loss or illness can make previously realistic goals completely irrelevent. Sometimes your original goals or habits are no longer your top priority. This is when I check to be sure I am moving forward on the life I want to live NOW not “someday.” I add a few important and/or time sensitive tasks that move me closer to where I want to be to my week plan. Now, it’s important to note that my kids are 7, 5 and 2 and we homeschool them all. If I had the older ones in school, I still wouldn’t be here yet because they spend a lot of time together. If I only had littles at home, this wouldn’t happen; it would be the wrong season for planning & big goals, habits, to-do lists and housework. I fought this for years but finally came to realize that raising little people is a HUGE time committment. There isn’t time for anything else while they are still so in need of your help for every. little. thing. I’m pretty excited about the Work the Plan Homeschool module that she released in December. If you are in a season where you can get some things done but don’t know where to start, I recommend the Simplified Organization e-course & Work the Plan. It is seriously worth every penny. Simplified Organization covers several aspects of your life as a home manager. Work the Plan is a quick start to getting things done/project management. I did WTP first to jumpstart my productivity and went back to SO. Both great courses! I highly recommend them. How do you stay on top of your mountain of tasks?